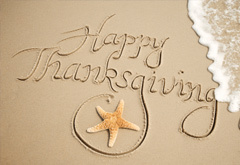 The Mission Bay Aquatic Center will be closed November 11 for Veteran's Day & November 21-28 for Thanksgiving break. No classes are scheduled for these days. We will reopen for classes and rentals on Saturday, November 12 & Tuesday, November 29th at 8:00am. Have a Happy Thanksgiving!